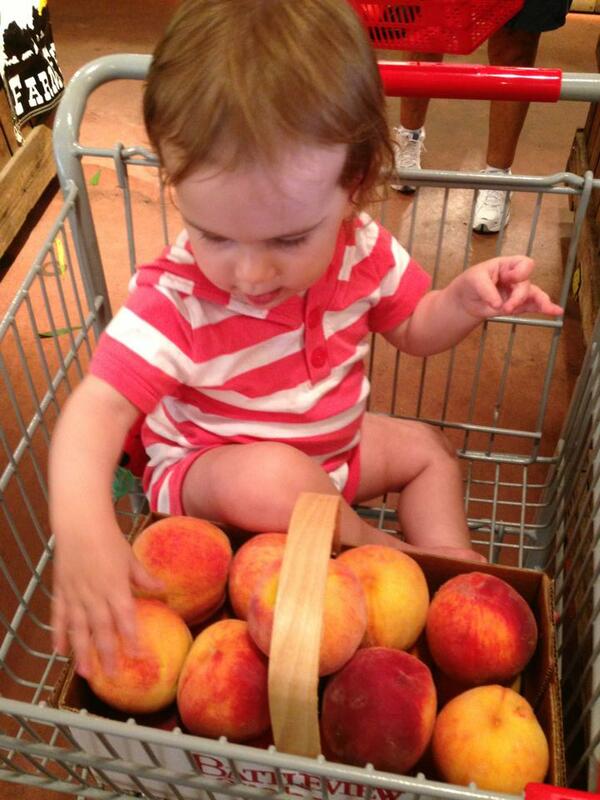 When peach season fired up last month, H and I made a pilgrimage to the nearby Battleview Orchards to load up. The peaches were so good that I had to make a cobbler with them, despite being spectacularly uninitiated with peaches and cobblers for someone who went to college in Georgia. I have a historically weird relationship with peaches, which basically means that since my entire childhood experience with peaches involved Dole fruit cups, I failed to see what the big fuss was all about. Until I started cooking and baking and canning in earnest as an adult. That opened my eyes to the magical world of fruit. And 99% cacao Scharffen Berger’s chocolate, but that’s an entirely different post. 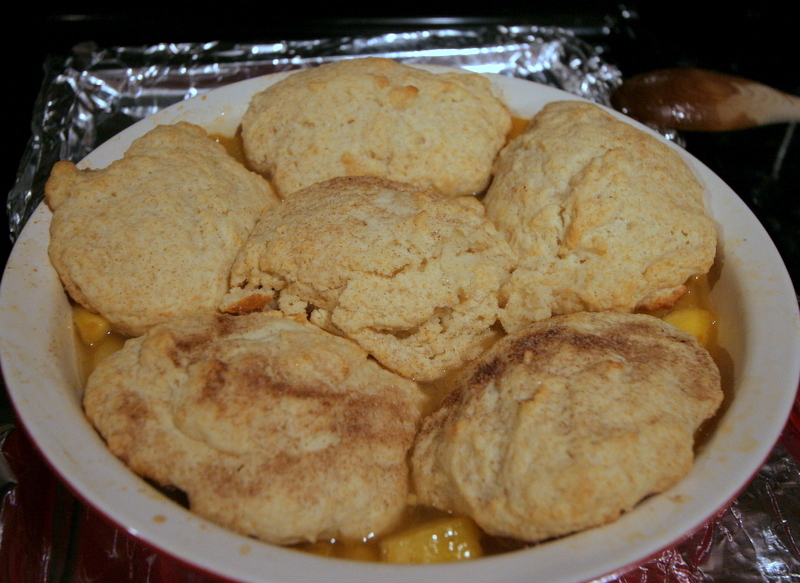 So I made cobbler. From the supremely handy and easy “Fresh Fruit Cobbler with Biscuit Topping” recipe from my favorite America’s Test Kitchen Family Baking Book, which just gives you the formula to make a cobbler with pretty much anything. And includes sassy biscuit options like cornmeal biscuits and gingered biscuits. It’s kind of idiot-proof. And really, really delicious. I might make the biscuits on their own sometime for breakfast, they were that good. To peel the peaches I followed the book’s tips: Score the peaches with an “X” at the bottom. 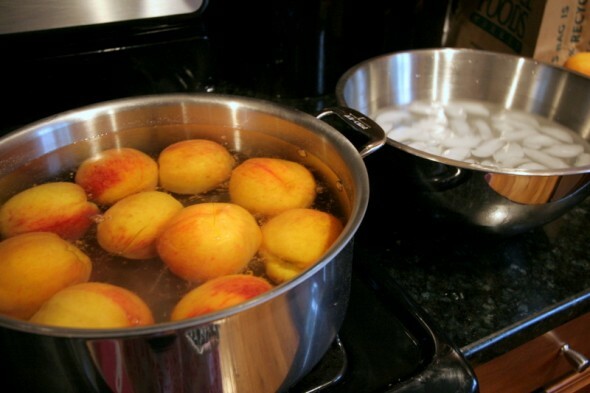 Put the peaches in boiling water and simmer for 30-60 seconds, until the skins start to loosen. Transfer the peaches to an ice water bath immediately and let them cool for about a minute. Then use a paring knife (or your fingers) to peel off the skins. You will get messy, but it works. 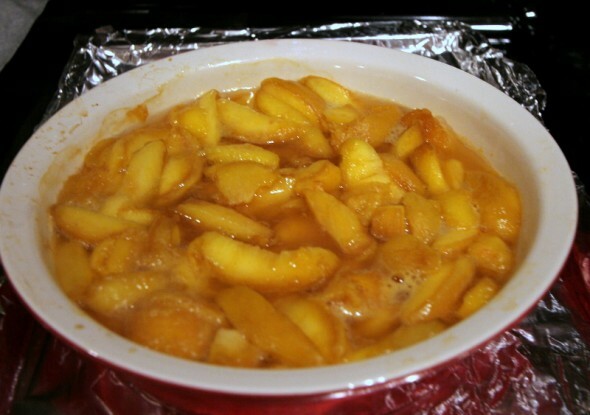 Make the pie filling: Pit and slice the peaches, then combine them in your pie dish with all of the other filling ingredients. Toss to coat everything, then cover the pie plate and put it on a foil-lined baking sheet. Set aside. 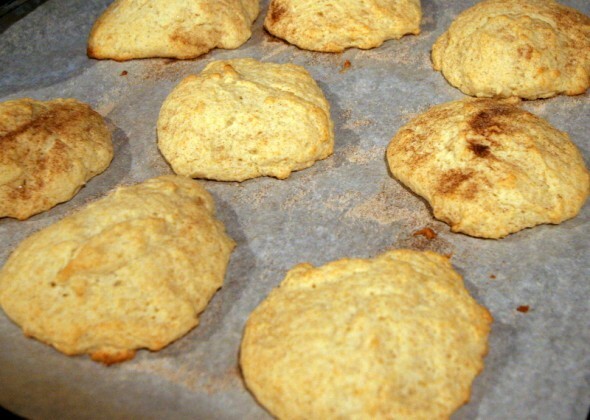 Make the biscuits: Whisk the flour, 1/4 cup of sugar, baking soda, baking powder, and salt together in a large bowl. In a separate medium bowl, site the chilled buttermilk and melted butter together until the butter forms small clumps. Stir the buttermilk mixture into the flour mixture with a rubber spatula until just incorporated and the dough pulls away from the sides of the bowl. 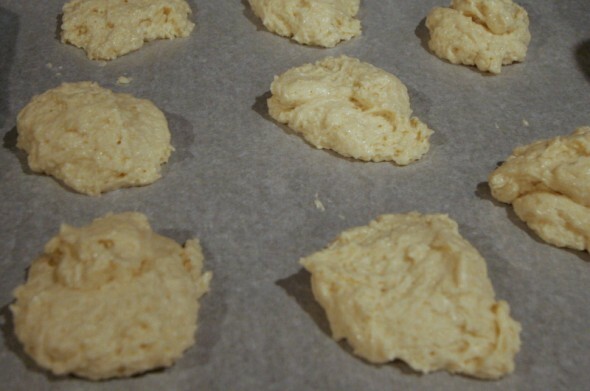 Using a greased 1/4 cup measuring cup, scoop out and make 8 mounds of dough on a parchment paper-lined baking sheet. **My dough was a little soft because my butter was, I think, too hot still. So my biscuits spread when they baked but were still delicious. 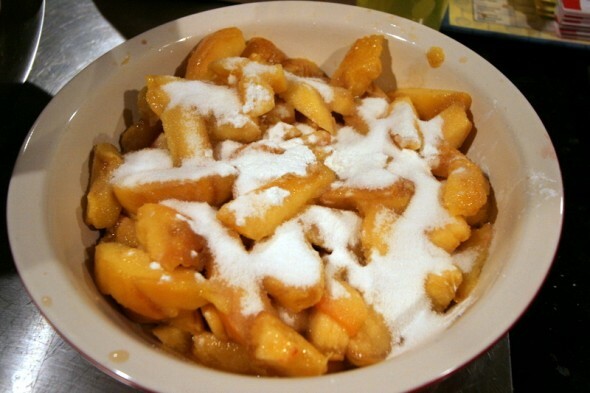 Toss the remaining sugar with the cinnamon and sprinkle over the tops of the dough. 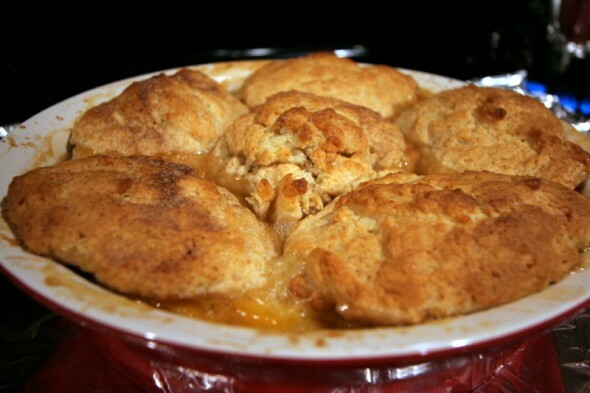 Bake the biscuits until puffed and lightly browned on the bottom, about 10 minutes. Remove the biscuits from the oven and set aside. Place the fruit mixture in the oven until it’s hot and the juices have been released, 20-25 minutes. Remove from the oven and take off the foil. Stir the fruit gently, then arrange the biscuits over the top, squeezing them slightly as needed to fit into the dish (no matter how I squeezed, I could only get 6 of them in…again, I assume because mine spread). 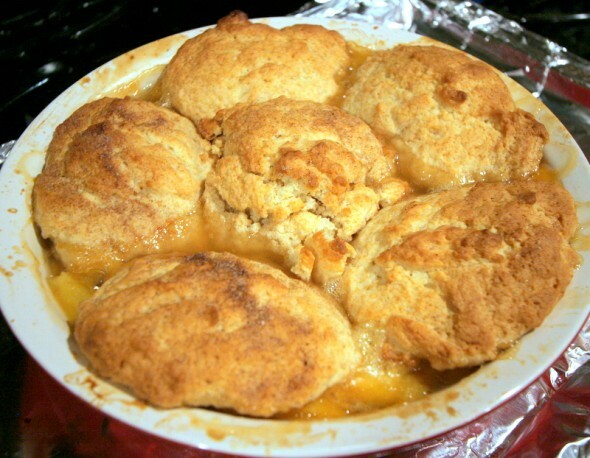 Bake the cobbler until the biscuits are golden brown and the fruit is bubbling, about 15 minutes, rotating the dish halfway through baking. Let it cool 10 minutes before serving (with vanilla ice cream).